I need to move to a new apartment, my lease is up in Aug. I need to find a place that I can afford and fit my needs asap! I did find one place that I really want but theirs a big chance it will be rented out before my lease is up. I've searched for spells to help with this with no luck. It seems that you can only find 'how to rent out a place'. Try an attraction spell, to attract a new living place. If you are Catholic, petition Our Lady of Loreto. Who would you petition or what candle would you use to find a safe, reliable and comfortable used motorhome for me to buy? Oh, and one that I can afford. Or a money miracle that will afford me the money to buy the motorhome I need to travel safely with my four dogs and a cat and a husband and live in it for a while comfortably. There are a few saints you can petition for transportation, such as St. Christopher. The home aspect would be covered by St. Joseph, who is the patron saint of selling homes and property. 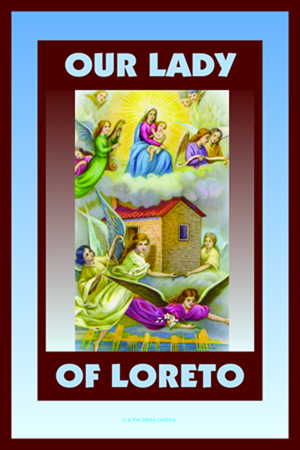 Our Lady of Loreto is the patroness of finding a new place to live. I would do petitions to these saints. I might add some good luck (for finding the rv) and for money. Hey, can't hurt. Might help. We found the motorhome yesterday. I burned a St Joseph and a St Chrisopher Candle. T folks who owned the motorcycle were very nice. The brother in law had a very nice energy who reminded my of my grandfather. My grandfather used to be a truckdriver who once won an award for safety because he saved a bunch of lives, so it seem to be a good sign. Also, the bear my mother made out of the flannel shirt my grandfaher passed that I keep in my bedroom seems to have moved. Before I could ask my husband if it had, he asked me if I could smell whisky. I take these all to be good signs. Now I am going to get the safe travel mojo bag and place it with my grandpa bear and keep it in the motorhome. I'm currently in the market for a 3 bedroom apartment with two close friends here in NYC that we aim to attain within the next month. I've got a couple of Saints working on our behalf already (shout-outs to Anthony and Expedite!) and they've delivered some killer signs that have been encouraging and keeping my faith high. The only thing I want to work on now is how we're three young adults with a history of decent to not-so-great credit in an area where application approval often requires that each renter makes 40x the rent or have a guarantor. None of us have any of this. I'm so far considering putting the business cards of the three senior agents in a honey jar. Any thoughts? Suggestions? I appreciate your wisdom. Honey jar is good. In reference to your question it depends on your intentions do you want to influence, compel, or command what you want? There’s this particular apartment that I found that very much suits my budget and needs. Basically, perfect for me.. Plus, no broker fee which will help me save a lot.. Also, the house will not be available until April, timing is simply perfect for me! I will be going over the house on Saturday to fill up an application. The owner told me that there are a lot of people interested in the house because of its location (located in a very great area of town), and they are accepting applications. I do hope to get this apartment. I am planning on lighting an Orange candle for Mercury. My intention is that I am the one selected to rent the place, and as well as remove any competition from the apartment.. I plan on lighting the 7-day candle on Wednesday (Mercury)..
Also, I have a picture and address of the house, and the name of the landlord.. I plan on placing these items as part of my petition. Should I need to add more? Are my choices of herbs and oil combinations good for my intention? Should I also add honey to sweeten the landlord in my favor? I would work a honey jar to sweeten the landlord to you. I would also sneakily dust the application with Influence Powder if you have it. You should try and get some dirt from the block of land the apartment is located on, and use that in your work. I want this really great apt that I had looked at online. I was thinking of doing a lodestone spell with the picture. What oil would I need to use and is there anything else I should do. Well you'll need food for the lodestone,and Attraction oil, or Lodestone oil, and some candles at least. You can save yourself some money and a headache and just buy the Lodestone spell-kit, and if you work out the cost of things, a good deal. You can find the spell-kits here. What is preventing you from getting this apartment? Is it money? Credit score? lack of roommates? What ever it is. I would do a road opener or a banishing candle to remove this obstacles. Then do the loadstone kit. ok I do have a Road opener candle on it way I was going to use it for blockage to help with my travel business I just started up. Can I petition both on the same candle? Also I think that my credit score is going to block me. You can pray that all blocks in your path be removed. um kinda new also but um thinkin attraction, or mayb look me ova, it makes me stand out, or isnt there 1 i cnt think of the name of it, but it's like i can, u can't. i always dress my papers with crown of success and fast luck. should you use a green candle if you go the honey jar route? I am in quick and serious need of a new apartment by the end of next month. I found a fantastic one but it is a little too pricey. I started a honey jar to work on the Mgr. so far it seems to be working, I've got him to agree on a few terms and he is calling everyday to urge me into a lease. I have been using green candles on a honey jar as well as dressing it with attraction oil and using attraction incense. Someone suggested using a purple candle? 1. Should I use a purple candle? 2. If I do should I dress it with commanding oil? 3. My ultimate goal here is to get him to lower his rent price to my desired rent price. Since you want it quick, consider Fast Luck or petition St. Expedite. One more question the actual honey jar spell kit for commanding oil says its uses yellow candles and the compelling kit says it uses purple candles correct me if I'm wrong but he didnt promise to lower the rent I am trying to get him to lower the rent so shouldnt I use yellow candles instead of purple? Use yellow for devotion to saints and for gold. 4 inches tall, 1/2 inches in diameter, burns for up to 1 1/2 hours. Use purple for conquering, mastery, and success. 4 inches tall, 1/2 inches in diameter, burns for up to 1 1/2 hours. Just confused a bit and only have one shot to get this right-thanks so much! The Commanding kit uses yellow candles for success, victory, etc. over the person/situation. The Compelling kit uses purple for increasing your personal power, in this case, over someone. It's a subtle difference, but if he hasn't promised to lower the rent, then you can't really compel him to follow through; you want to Command him to lower the rent. I went to look at an apartment today and love it! Older house, large lot, only one other apartment in the house, and best of all the price and location are PERFECT! However there were other people there also looking at it and I want to be sure I am the one to get it. Any help, ideas, etc would be most welcomed! Since time is an issue you may want to get the church to set lights for you to blocks anyone's path and open yours to secure the apartment. Dress the papers with Attraction or Look Me Over, you can use more commanding products if you desire. Get yourself a honey jar and toss in the people who will make the decision on who gets the apartment and work that daily until you hear from them. Get dirt from an ancestor and mix it with dirt from the property and ask that the spirit work on the individuals involved to help turn them in your favor. Work this along with Road Opening work to help clear out any obstacles. Thank you, JW! Those posts gave me some good ideas and reminded me I had some other tools around the house to use. ConjureMan wrote: Dress the papers with Attraction or Look Me Over, you can use more commanding products if you desire. Thank you, CM.....definitely going to dress the papers. I'll try a small honey jar, but I don't even have the name of the property owner, just broker and no personal concerns for either, so I'm not sure how far I'll get with it, but it certainly can't hurt. I need the same things right now! When we were looking for a rental, I burned a brown 7-day candle (for contracts) with attraction oil. For my petition, I listed everything we wanted - enclosed garage, kitchen appliances, safe neighborhood, good landlord, etc. I prayed to my ancestors for help - surely they didn't want to see me homeless or living in a horrible neighborhood? I also burned a candle to St. Expedite (for speedy assistance). Other than having a weirdo busybody neighbor, our new place was perfect! If you're in a situation where other people are vying for the same property, consider doing work on the seller/landlord to get them to favor you. I live in a rapidly decaying NYC apartment. The icing on the cake for me has been the mushrooms now growing out of my bathroom wall!!! I now make a decent salary, but my credit is awful do to filing bankruptcy a year and a half ago. Can't get an apartment with bad credit and no cosigner. I have my eyes on two new apartments, but feel like I shouldn't bother to apply because I know they will immediately reject me based on my credit report. The two apartments are listed with large corporate rental management companies, so they have the means to check a background thoroughly. Does anyone have any advice on what to do? Any and all advice is very much appreciated!!! ngreen35 wrote: Can't get an apartment with bad credit and no cosigner. I have my eyes on two new apartments, but feel like I shouldn't bother to apply because I know they will immediately reject me based on my credit report. My first bit of advise, is that you must lose this defeatist attitude you seem to protect, it will do you know good. Your not beat yet, never give up. I suggest a twofold strategy. First begin working with spirit to bring you the help you need to get this done and the means to do it. You can work with Saint Joseph or Our Lady of Loreto if you are comfortable with Saints, but honest prayer to God, or however you conceptualize the divine, will do so much good. Work Crown of Success products, wear the oil, bath with the bath crystals, smoke the paper work and dress them with powders, dress your self with them too, after the bath. Now the second part is dealing with where you live now. You may be there awhile so you best set it to rights. First off your landlord has a responsibility to keep the building in good repair and that means no wall mushrooms! Talk to him/her about it and work Essence Of BendOver and Compelling to get him/her to follow through and get that taken care of, to do that you dress a purple candle with those oils, carve "Do what you promised" or the like and burn it on a petition paper with there name written nine times, turn the paper 90 degrees and then write your full name over it nine time. And of course you should be doing regular spiritual cleansing's of the house and protection of some sort. And then go through and bless the house that it can be a place of safety and comfort for you until you can move on to something better. In addition, to that i would work a road opener to remove obstacles in your way as well. Last time I was looking for a place I petitioned St Expedite, as it was urgent; I wasn't sure I'd find one as I have cats, but I found a great place, I've never been in a better flat. I've also petitioned him for a job whose references check I would pass: they did check my refs but as i'd worked for an agency and the agency lost employment records, I got the job. Obviously I was able to prove they paid me though! I'd just add that to your petition - ask him to help you find a good, cheap apartment in a safe area near work, with a good landlord etc etc, and ask him to help you pass all the checks. And it might be worth looking for a private landlord. They might ask your current one for a reference, but probably won't run a credit check. St Joseph is well known for helping with housing issues as well. It's not as though you're asking for the moon and the stars: a safe, clean, non-mushroomy place to live is a reasonable request. Otherwise, it might be best just to be upfront. There are a lot of people going bankrupt these days; if you have a good history of paying your rent, you might be ok. Explain what led to the problems; explain that you're making plenty now. Would your manager maybe be a reference? Not a guarantor on your rent, but a personal reference. I was in a similar situation a few months ago, except I didn't have any credit at all. I did a road opener and an attraction candle and it worked for me, I now live in a great apartment with exact qualities I was looking for and it was extra easy for me to get it. Also, be upfront with your prospective landlord and dust all your paperwork with Crown of Success. Good luck! I will begin the excellent homework you guys have given me...it is definitely time for the mushrooms and I to part ways! Didn't mean to scold,lol, sorry if I came off a bit harsh. hey everyone me and my HUGE family live in a tiny tiny small 2 bedroom apartment,there are 7 of us in this house,6 kids one parent. Mom is on walfare already and recieves foodstamps and stuff...is there any spells possibly for us to move to like a 6 bedroom house(at least) for a price that my Mother can afford? she can't work due to she fell off a ladder and broke her tail bone. is there a spell for getting us a bigger home? we move ALL the time i have never been to a school more than a year(im in 11th grade) including moving to different states! im really tired of moving soo much as it is affecting all of us kids with friends and school work.i just want a stable big enough home like every other family we see.where we can make long time friends.with us moving sooo much has caused me soo many problems. I always think why me why God is doing this to me. can you all help me with a situation like this? I think there are a lot of circumstances here. I am not sure where you are from but if you can get on some kind of housing assistance program such as section 8 (housing based on income...you pay low rent) then I would look into that if your mother has not already. In addition, in order to get a bigger house it is going to require some sort of income or assistance from someone. I think it would be extremely wise of you to get a reading regarding this matter. I mean I can tell you to do this an that, but it may not be effective given your circumstances. Geez, i saw this too late, i think. I have been busy all week teaching my apprenticeship class. I hope everything went well for you. We are still in a bit of Limbo now. We have to wait for Tuesday. We did not get the first apt. But now have a 2nd one that we really love. It's located more in the city but has been completely renovated and is on the first floor. So if anyone can recommend anything I appreciate that!! Many blessings! Fast Luck pops into mind. Perhaps prayers to St. Jude and/or St. Expedite to grant you the new lease and quickly so you can get away from that other landlord! I'm definitely thinking a Mission Light b/c those have done me great.. Here in New York City, Brooklyn specifically, it is a treacherous thing finding an apartment! I am putting this out here wondering if anyone has a suggestion. All appreciated greatly. Lots of people like to work with St. Joseph for anything to do with real estate, but more tradition-minded folks reserve him for selling a house or finding a tenant. I have a client who thinks this way. Something [my home!] is lost, and must be found! Our Lady of Loreto is another one whose help is sought when trying to move to a new place. I'm designing a "Perfect Home" altar for my client. I know there will be pictures of houses in it (she's supplying those) and earth and leaves from the neighborhood she wants to live in. With these elements, you could dress candles, make a mojo bag, or even an entire portable altar in a little box. Thank you St. Jude for interceding in difficult times. Have you tried Craig's List? You'd be surprised how lucky you can get with that! For me, I didn't even have to do an elaborate spell, just a simple petition paper. I wrote down a list of conditions that I wanted (ex: laundry facility in the building, rent under a certain amount, neighborhood, etc), rotated it 90 degrees and then I wrote my name over it. I concentrated on what I wanted (and was sensible enough to make sure those were reasonable requests), dusted it with some attraction powder and had a great apartment that fit my budget within a week. birdsong wrote: Have you tried Craig's List? You'd be surprised how lucky you can get with that! Birdsong quick question(s) if I may, that simple petition paper with the attraction powder dusted all over it can this also work with finding a job (list the type of job I am looking for with the attributes I seek from the next job I am looking for?) & can I also add fast luck powder onto this piece of paper as well? Thank you in advance for helping me out with my questions. Yes, I think that should be fine! Attraction, Fast Luck, St. Expedite, Money Drawing, and maybe some High John the Conqueror? I'm actually not an expert in hoodoo and only started to incorporate some elements of it in my spellwork this year (my background is more rooted in Wicca/Paganism/folk magick/Eastern traditions). For me the petition paper has been a great way to force myself to sit down, calm my mind, and really focus my intentions. And then writing my name over the list of requests is very empowering! I can't speak for others but the most significant part of any ritual for me has always been focus focus focus! I would also consider doing the spell during a waxing moon, on a Thursday or Sunday in the hour of the Sun or Jupiter. I didn't burn a candle for my spell but you could consider doing one with a green candle inscribed with words like "employment" and "success" and anointing it with the corresponding oils of the sachet powders mentioned above. Then maybe drop some of the melted wax on your paper, fold it toward you, and either keep it in a green mojo bag with the appropriate herbs or in your wallet. Personally - like I said, my spell was super simple, and all I did was carry the paper around in my bag with me and I definitely had it with me when I went to check out the apartment. I actually haven't gotten rid of my petition paper yet! And it's been a whole year! It's just sitting there in a box with other similar papers...I would like to know how to dispose of them too so I'll await the wise responses of other more skilled members here. thanks guys. all this sounds awesome.....maybe magnetic sand or lodestones? yes I'm looking through craigs list the timing has often been off. that's another thing I'm working on. I found an apartment that I really want and is perfect. I want to ask lm to set lights for this. Which candles would be best? Maybe a road opener to unblock obstacles that are in the way, if any. I applied there and want to get in there fast but the waiting list is long. I'm also thinking an attraction candle. I also work with Santisma Muerte, who has been great to me and helps with stuff here and there- lowered a phone bill, got me money to get something, prevented my bird from being hurt- I had talked to her about the apartment I wanted and put the apartment manager's business card on her altar. You can work with Santisma Muerte if she has helped you in the past, and if you know how to work with her. Birdsong thank you so much for your reply back to my post of questions, very helpful will try all of you suggestions & advice. Can't wait to try this. I have the attraction, CofS, money drawing, steady work oils and powders. I was thinking about working with St. Joseph, but i would be doing strictly rentals right now, can I still work with him though? All of your ideas sound great...and what you have on hand can work for you. I have read here in the forums that people who work/sell primarily on the internet, rub their hands with the oils before posting, designing websites, dress their computers (lightly) etc etc. However, I would keep a dressed candle going while working any of the conjures listed. You should wear the oils as you work toward your goals. Consider working the full Steady Work and Money Drawing Spells and you can certain include Crown of Success.... they are all my favorites. My landlord is selling the home I rent and I am looking to move. The good thing is I never felt "good" here. Like I don't belong here. The bad news is the landlord was my friend so I paid very low rent in a nice home with everything included. The only advice i need , is what items could I buy now, to begin work to find a new home (apt to rent.) , that is cheap, in a nice area, and will allow my business (tarot reading). It is hard, as I need a zoned area that allows businesses, at a good rate. That I love. What items can I buy to find this perfect place to rent? So, I have the plan for items I am ordering from LM, after I get the home! Chinese Wash, to clean the whole new home in when I find one. And Money House blessing items to work before I move in, to hopefully make this home good.